Product prices and availability are accurate as of 2019-04-20 10:41:39 UTC and are subject to change. Any price and availability information displayed on http://www.amazon.com/ at the time of purchase will apply to the purchase of this product. Fits on Monarch Mirror Door Series 500 This CRL Mirror Door Roller Mounting Bracket is an extruded aluminum adjustment bracket used with a N6599 Wardrobe (Closet) roller. It fits on Monarch Mirror Door Series 500 . 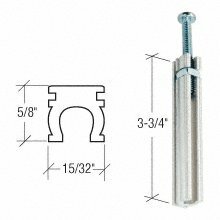 Minimum Order: 1 Package One bracket with adjustment screw per package.